This is our first off road drive. 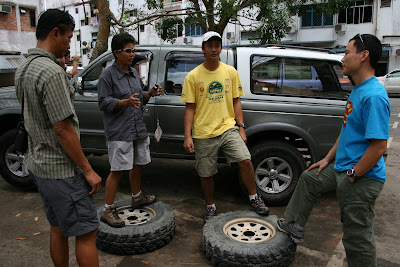 Journey started in Kota Kinabalu where we met Malcolm, Eunice & Mel Jr. Driving from KK to Lawas was on road, before we changed to off road tyres at Lawas. Here, Eunice gave us a short briefing of the day's drive. 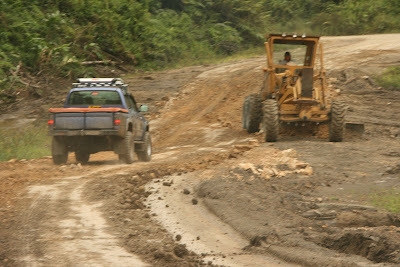 From Lawas to Merarap was gravelly roads. It rained along the way & vision got really bad. 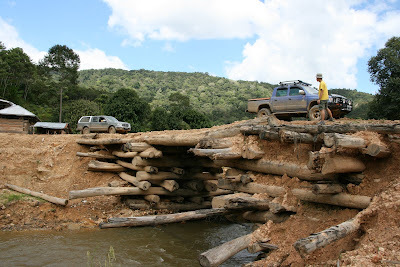 What was more worrying was the road we're going to be the next day. 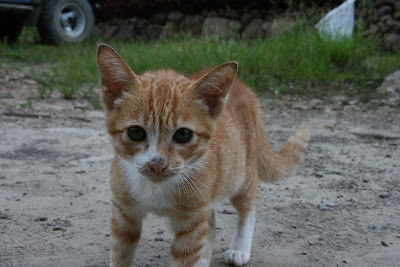 Arrived at Merarap Hot Springs Lodge to spend the night & we were greeted by a little kitten, probably 2 mths old, which we adopted as Ah Meow during our stay. She would follow us wherever we went & was especially attentive during meal times. The lodge is located amongst forest & next to gushing rapids. 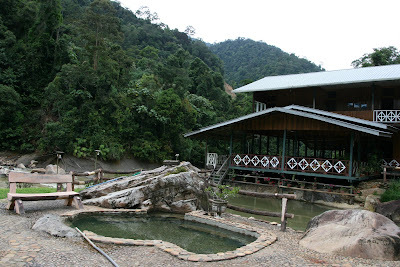 A couple of hot spring pools were in the compound for visitors to soak in the 40 degree water. Mel digs his arm into the mud to hook the tow rope on. A bit of shovelling will help the front wheel get out. 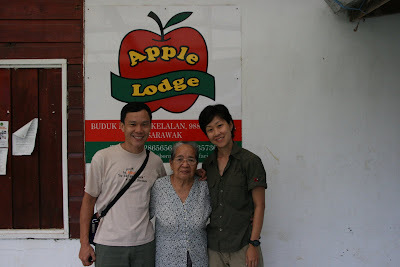 Arrived at Ba'Kelalan Apple Lodge in the evening. 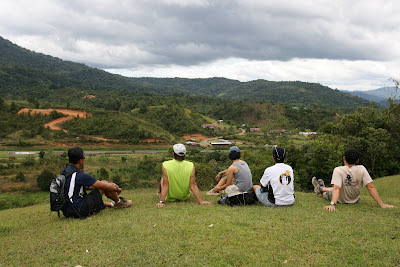 Ba'Kelalan consists of 9 villages,in the Bario highlands of Sarawak. They have apple & mandarin orange orchards & also a couple of vanilla trees & vegetables. Paddy fields produced their special Ba'Kelalan rice, which was served during lunch time... fragrant & chewy texture, in between glutinous rice & regular polished rice. The grains were smaller than thai rice too. Opposite the lodge is the local air strip. 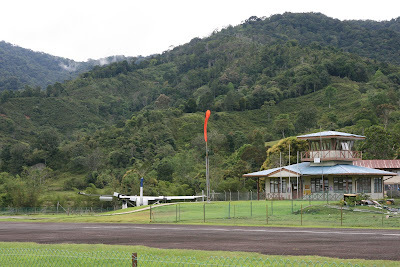 19 seater planes from Lawas & Miri arrive 2 times a week.